Growing concern about Mississippi River course change. The Mississippi River has changed course to the Gulf every thousand years or so for about the last 10,000 years. Gravity finds a shorter, steeper path to the Gulf when sediments deposited by the river make the old path higher and flatter. It’s ready to change course again. It wants to take a short cut at the Old River Control Complex down the Atchafalaya River to the Gulf at Morgan City, Louisiana. It’s 193 miles shorter and steeper and faster than going by New Orleans. Gravity makes water flow downhill. The higher the hill, the greater the “head” or force driving the flow. Floods on the Mississippi raise the water level inside the levees and increase this force. Floods are becoming more frequent, longer, and higher — even though average annual rainfall in the Mississippi drainage basin has been almost flat since 1940. It has flooded every other year on average since 1972 vs. once every six and a half years 1940-72. It has flooded eight of the last ten years at Natchez. There have been two hundred-year floods within five years (2011 and 2016). The odds are over a thousand-to-one against this. The average level or stage of the river has risen ten feet at Natchez since 1972. So, the head or force to drive a course change is increasing. Hence, the odds of a course change are too. Ironically, this is due in large part to work by the US Army Corps of Engineers, which is supposed to control floods. 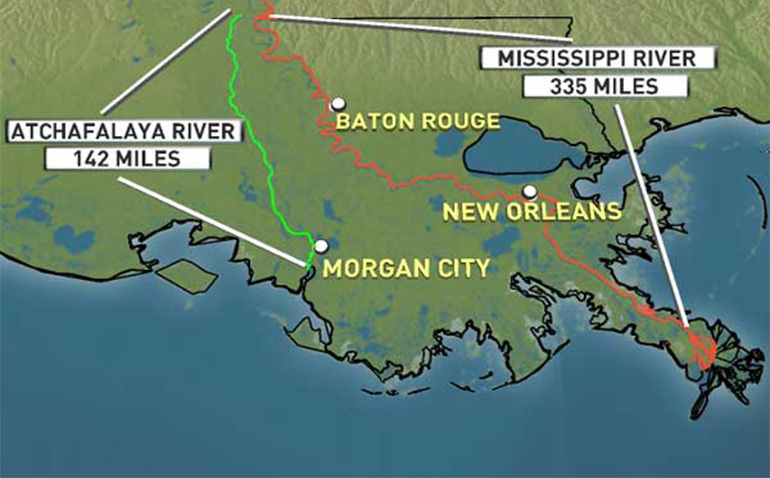 And by the Corps operation of the Old River Control Complex (just above Baton Rouge), where it restricts the Mississippi’s flow into the Atchafalaya to 23% of its volume. This restriction, together with work by the Corps to shorten and straighten the river and speed its flow, has caused it to rise. And to flood more. These floods now damage property inside the levees and along the Mississippi’s tributaries (about 1.5 million acres from Greenville to Baton Rouge). But they could lead to a catastrophic levee failure — and course change. And to much greater damage for Louisiana and the nation. That’s the subject of a recent article in The Advocate of Baton Rouge and also a similar recent article in The Times Picayune of New Orleans. It’s also something we have been talking about and testifying about before the Mississippi River Commission for the last two years.